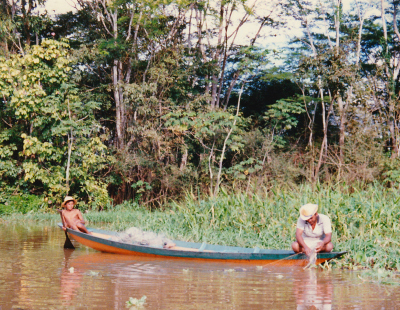 It had taken us a couple of days travelling up the Amazon from Manaus to reach the area where our boatman’s family lived. I liked the system. We paid for enough food for six people (there were two of us) and he stopped en route and cooked for us and whoever’s fire and pots we were using. The Hotel California – as the family called the rough shelter with a couple of hammocks slung underneath – was a few metres from the river. This felt like the real deal. My traveling companion had only fallen in the river once as we negotiated the rickety planks between our ‘hotel’ and the families floating room. He scrambled out quickly before the piranhas got to work and the family were greatly amused. Proudly they showed us their treasures. An empty coke can and an empty packet of Wrigley’s chewing gum, carefully folded to look as though it were full. Using a torch to look for the reflection of their eyes (obviously overlooking any facing the opposite direction or blinking) we crept silently through the water. After a couple of failed attempts the boys managed to grab one by the tail and yank it, thrashing, out of the water. It was, thankfully, only about a meter long but still, not something I would have chosen to get hold of in the dark. We dutifully admired their prowess and their catch and then urged them to release it back into the wild. They were baffled by this idea but reluctantly cooperated and we headed back to shore and another night of learning how to sleep in a hammock while ignoring all the potential things that could join me here in the depths of the Amazon. A few hours later they shook me awake with glee. I opened my eyes in the gloom and saw the source of their excitement. They had caught me another crocodile and this time, without the handicap of squeamish good intentions they had killed it. They showed me how, prising its jaws open to reveal how they had cut off its tongue. Well if there’s something more challenging than trying to sleep in a hammock, I realized, it’s being woken up by a dead crocodile (I guess being woken by a live crocodile is one step worse). I swallowed my alarm and made nice noises, they were so proud of their gift it didn’t seem like there was any considerate alternative. These people lived extremely simple lives. During the short time I spent with them I saw humour, fear, sadness , rivalry– many of the same human experiences we share in our cluttered world of technology and multiple options. Oddly I didn’t see boredom. Has our drive to excess used up our tolerance and patience? Nowadays I try to recapture the art of being still in the moment and living in the present. Honour the moment and cherish the day. You never know when the crocodile hunt could change everything. ← It’s a man’s world?